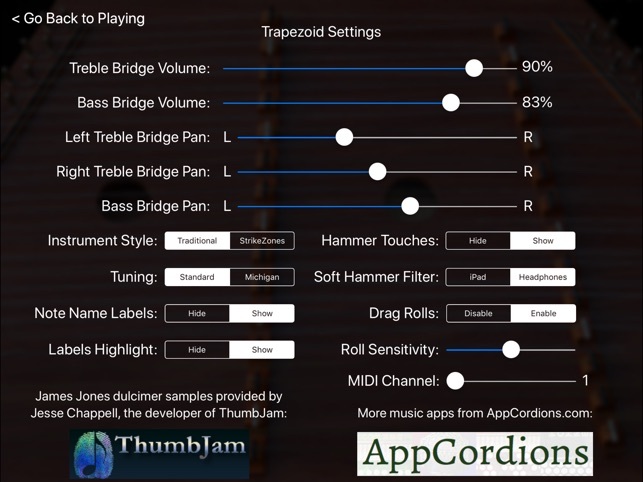 Trapezoid is an amazing Hammered Dulcimer for the iPad. Written by an experienced Hammered Dulcimer player, this virtual dulcimer sounds and plays like the real thing! 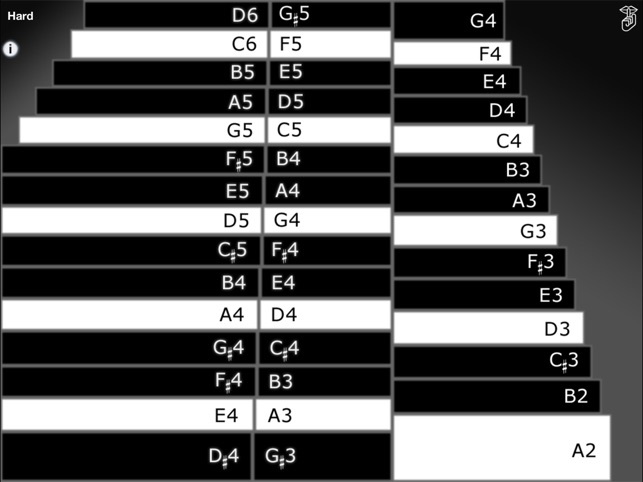 The app has the full range of a standard 15/14 instrument and supports both Standard and Michigan (octave) tunings. 15/14 means there are 15 bridges on the Treble (left) side of the instrument, 14 bridges on the Bass (right) side of the instrument. To play, just touch the strings on either side of the left (Treble) bridge or the left side of the right (Bass) bridge just like on the real instrument. Toggle between Hard or Soft hammers sound by touching on the "Hard" or "Soft" label on the upper left corner of the screen. The app also may be played from a MIDI keyboard connected to a hardware MIDI interface or other MIDI controller or MIDI file player apps. When playing via MIDI, the app is velocity sensitive based on the velocity sent with the Note-on events. Lowest MIDI note is A2 (MIDI note 45). MIDI range is fully chromatic from A2 to D6. When playing via MIDI, the volume is based on the Treble bridge notes volume. The app will respond to MIDI volume messages on the selected MIDI channel. The new "StrikeZones" instrument style shows you exactly where to touch on the screen for each note. The zones light up when touched. It is an excellent tool for understanding or teaching the layout of the instrument. - Using the "Soft Hammer Filter" control, choose between equalization of the soft hammer sounds for best sound through the iPad speaker or through headphones. The "iPad" setting optimizes the soft hammer equalization for playback through the iPad speaker. The "Headphones" setting optimizes the soft hammer sound equalization for headphones or for use when connected to an amplifier through the headphone jack. The "Headphones" setting allows more of the low frequency content of the sound to pass through for best quality. Touch the "Shhh" button on the upper right corner to quiet all the ringing strings. To truly experience the full stereo spread of the instrument, plug in a set of headphones or amplified speakers. Audio samples of Wes Chappell's amazing dulcimer provided by Jesse Chappell from ThumbJam.com. The instrument was built by James Jones, from Bedford, VA. I have played and taught the Hammered Dulcimer for over 20 years. This app sounds and plays as close to the real instrument as I'm capable of doing on a touch screen. Be sure to visit the AppCordions.com website to watch the demo videos! The app may now be played from a MIDI keyboard connected to a hardware MIDI interface or other MIDI controller or MIDI file player apps. Added velocity-sensitive MIDI control. Lowest note is A2 (MIDI note 45). MIDI range is fully chromatic from A2 to D6. Set the MIDI channel on the controls page. Works with more General MIDI player apps. Added support for MIDI Volume messages when used as a MIDI sound module. (as a passenger, of course😉). I've even dropped in on the occasional workshop & have used it to try out whatever technique is being taught. I especially like the fact that I have the option to tune the Dulcimer in Michigan Tuning (octaves) like my Webster Dulcimer or in the Fifth tuned style. Very handy as I teach to folks who have both tunings. I'm brand-new to hammer dulcimer is. I haven't gotten my instrument yet but this app is very realistically teaching me the way the notes are laid out. I had an intro lesson on actual instrument and this is really good. I was able to work out several songs already. 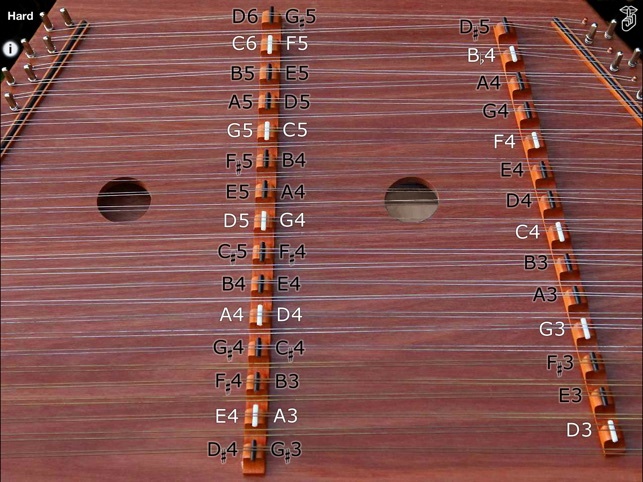 Great job and I'll be using this to help tune my hammer dulcimer when I get it. Very cool little app. Added a star because it was only 99 cents. The samples are noisy, a slight hiss accompanies each press of the note which would require some serious gating or EQ to make them usable for music production. MIDI implementation would be nice. As it is, it's cool for generating ideas based on the dulcimer tuning, or if you're looking to learn how to play the instrument.